I am a professional artist and teacher specialising in drawing and painting methods. I studied at London Fine Art Studios for four years beginning in 2011 before teaching there. The course I teach runs through the key elements of draftsmanship and in turn painting ( theory applies to all mediums). I show students how to break down any subject into the big simple design and develop a fully rendered drawing. I teach complete beginners to intermediate students. I tailor the course for the individual and while my practice is centered around traditional fine art many choose modern art routes. These disciplines of art all have drafting at their core, and in reality I teach people to "see" the world around them. I also run the printmaking studio at LFAS where I specialise in intaglio printmaking but also teach a whole range of printmaking techniques from linocut, mono prints and collagraphy. These techniques are easily accessable for a whole range of skill levels and ages. 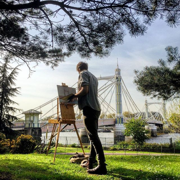 Through my time at London Fine Art Studios I have taught various drawing and painting lessons from groups to individuals, this includes beginner to more experienced students .